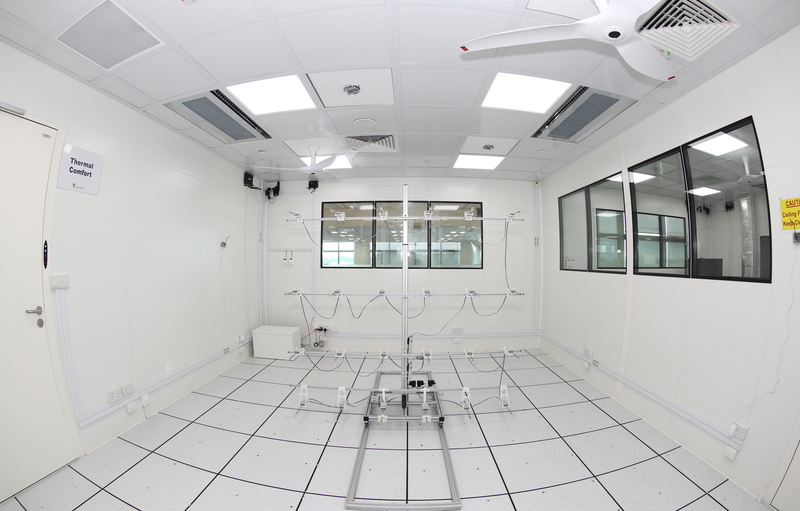 The SinBerBEST ACMV testbed consists of two air handling units (AHUs) supplying a total of four testbed rooms. The entire ACMV testbed is located within the BEARS dry lab space in the 11th floor of CREATE tower. CREATE indoor air is heated and humidified to match the outdoor air temperature and humidity (outdoor air is thus emulated) and is then supplied to the AHUs for cooling and dehumidification. Four Variable Air Volume (VAV) boxes vary the supply airflow rate to achieve the desired temperature in each of four testbed rooms (VAV principle). In addition, on the supply air path leading to the four testbed rooms, heaters and steam injectors were installed to enable the temperature and humidity of the supply air to be raised. 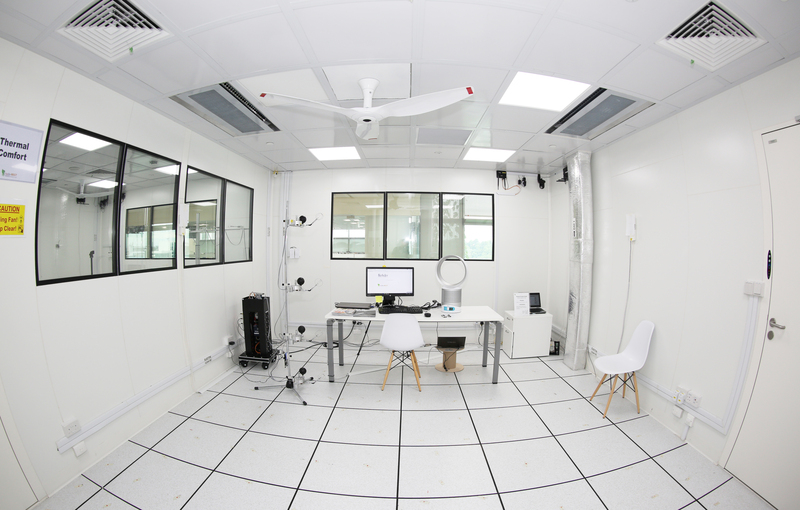 Hence, high temperature and high humidity can also be attained in the testbed rooms. The SinBerBEST ACMV system is heavily instrumented with high quality sensors that measure all relevant parameters such as air temperature, pressure, CO2 concentration, flow rate etc. All of the sensors, the actuators that modulate the valves and dampers, the VFDs (Variable Frequency Drives) that drive the fans, the duct heaters and the duct humidifier are all centrally connected to the National Instruments Real-Time Controller. The control loops are thus programmed using National Instruments LabVIEW and executed on the real time platform. The LabVIEW front panel or UI provides the operator full command of the ACMV system (Auto/Manual Modes, Logging, Visualization, Warnings and Alarms). The testbed rooms are also heavily instrumented and National Instruments data acquisition platforms are used to gather signal data and log them for analysis. ACMV Control Algorithm Research: Using modern control strategies such as model predictive control for energy reduction, the overall ACMV control can be implemented and studied under strict controlled conditions. Indoor Air Quality and Thermal Comfort Research: Physical and human subject studies can be conducted with desired conditions in the space. ACMV Mechanical Subsystems Research: Different ACMV subsystems on the SinBerBEST testbed can be interchanged with test units in order to compare and evaluate their performance. For example, AHUs with special hydrophobic coatings on the coils can be install on the ACMV testbed and evaluated in relation to a normal AHU. The following table lists the capability of the ACMV system in terms of achievable conditions in the testbed rooms.